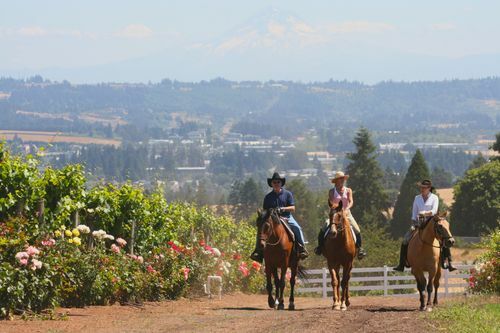 On a beautiful August day, our friend and Sherwood neighbor Sallie Cutler brought a couple of her horses over to Quailhurst to take Marvin on a trail ride around the vineyards. Her sweet, truly bomb-proof horses provided him with an opportunity to see the property from an entirely different perspective – horseback! There was a bit of haze from the California fires in the air that day, but if you look closely above the riders, you can see our beautiful view of Mount Hood.